Hand garden tools make gardening chores easy and enjoyable. Your choice of gardening tools will depend on the chores you will be performing, the amount of money you plan to spend, and your individual needs. Basic gardening chores include pruning, digging, raking, watering, and weeding. It is a good idea to have these tools readily available, even if you hire a gardener or landscaper to take care of basic gardening and landscaping tasks. Investing in high quality hand garden tools up front can save you time and money in the long term. The best hand tools are sturdy and should feel comfortable when performing the gardening task. 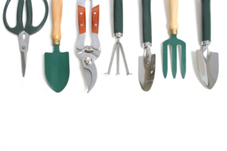 Hand Garden Tools – What Are Your Options? Pruning shears (also called secateurs) come in a variety of sizes and styles. Pruners are available in four basic designs: anvil, bypass, ratchet, and loppers. Anvil pruning shears have a single sharp, straight blade that closes down on a flat edge (similar to a knife). Bypass pruning shears make clean cuts using two curved blades that slice through stems like scissors. Ratchet pruners are similar to anvil pruning shears; however ratchet pruning shears have a mechanism that cuts in stages. Each cut goes progressively deeper until an effortless cut can be made. Loppers are long-handled, heavy duty shears used for cutting larger tree and shrub branches. Hedge shears have long handles and flat blades that look like extra-large scissors. They make large, even cuts, and are typically used for (you guessed it) trimming hedges. Hand cultivators are ideal for small gardening tasks that involve working the soil (breaking up soil, removing rocks and weeds). They typically have a set of three tines attached to a compact handle. The tines vary in length and width of separation. Hand trowels are used for digging small holes. They are the perfect gardening tool to use for planting bulbs, seeds, and small plants. Hand trowels have long, narrow, scoop-shaped blades that are attached to compact handles. . Gardening scissors are a sturdier version of common household scissors. The blades can be short and slightly rounded, or straight and long. Garden scissors are used for light pruning chores such as harvesting herbs or deadheading flowers. Gardening gloves protect your hands while performing gardening chores (planting, digging, weeding, raking, pruning, and fertilizing). They protect your hands from scrapes and puncture wounds, blisters, splinters, and keep them warm in cold weather. If you are performing light gardening tasks (planting, weeding, repotting) a general purpose garden glove is sufficient. For heavy duty chores (pruning, fertilizing, raking, shoveling, digging) you might consider a specialty glove tailored to the task at hand. Choose a grip enhanced glove for raking, shoveling, or digging. If working with fertilizers or pesticides, the best choice is chemical resistant gloves. When working with prickly plants (cacti, rose bushes, berry bushes, thistles), wear puncture resistant gloves for protection. Make a list of the gardening tasks you will be performing regularly. Include the tools required to perform each task. Research brands and pricing ahead of time. Make sure you are paying for quality, not just brand recognition. Consider ergonomic comfort. Some tools are custom-made for left-handed or right-handed use. If possible, go to a home and garden store and pick up the tools to test for comfort and inspect quality. Remember, you don’t have to purchase the tools then and there, you might get better deal by finding a supplier on the internet.